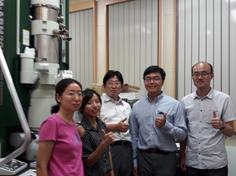 Prof. Guo of Shanghai Jiao Tong University has stayed in our laboratory for research collaboration (Dec. 17th to 22th, 2017). 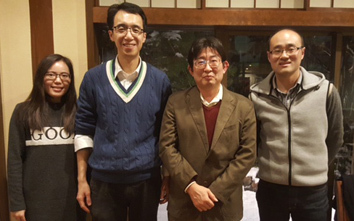 From left, Zhao-san (his student), Prof. Guo, me and Prof. Lei of Xi'an University of Technology. 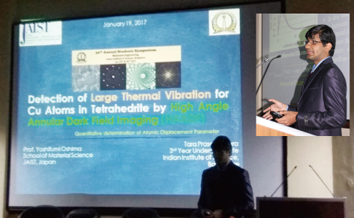 Mr. Tara Prasad Mishra (IISc Bangalore) has been awarded the "Most promising Young Researcher Award" in 30th Annual Students Symposium, which was held by Dpt. Materials Engineering, IISc Bangalore. It is amazing that he won it, because many post-doctoral and PhD students gave their presentations in the symposium. 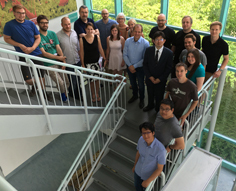 Prof. Zheng of Wuhan University visited to our laboratory. 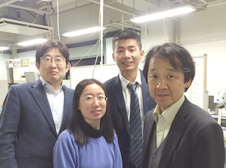 From right-side back, Prof. Zheng, me, Prof. Tomitori and Dr. Zhang at our laboratory.